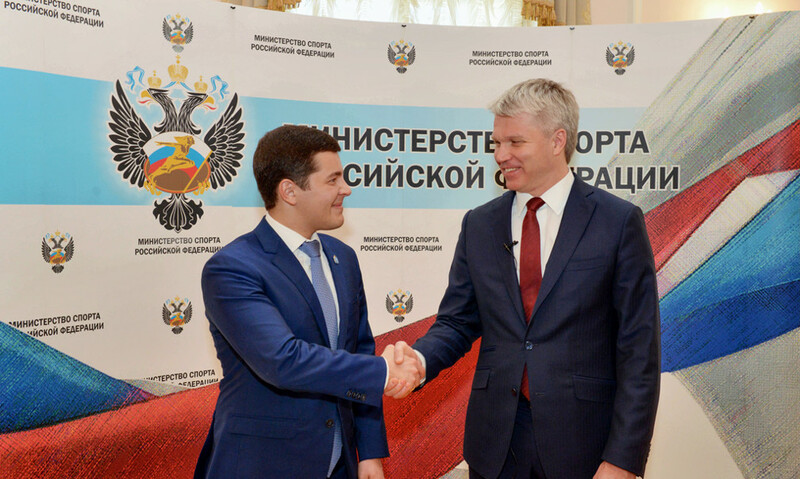 The meeting of the governor of Yamal-Nenets Autonomous Okrug Dmitry Artyukhov and the minister of sport of Russia Pavel Kolobkov took place on the 2nd of April. The head of the region told about development of sports infrastructure and prospects of conducting of the Arctic Winter Games in Yamal. If the international committee approves the application of the region, then the games will take place in Salekhard. “The delegation of the Arctic Winter Games International Committee worked in the capital of Yamal. It seems that the guests are satisfied with the level of development of sports infrastructure. If to take into consideration that the given games were never conducted on the territory of our country, then we have good chances. This is a very significant event with participation of representatives of the majority of arctic countries – Scandinavia, North America, Canada, Greenland and others. We hope that the application will be supported. And we together with the ministry of sport will start preparing for the competitions”, Dmitry Artyukhov said. The Arctic Winter Games have been held since 1970. Sportspeople from Yamal have participated in them since 1992, as an independent team — since 2004. The number of awards won by representatives of Yamal makes 587 medals, golden medals make a half of them. Many famous sportspeople started their career on the Arctic Games: Albina Akhatova, Luiza Noskova, Kristina Ilchenko Larisa Kuklina, Yuliya Makarova, and others. The Russian sports Minister supported the initiative of Yamal to hold the games and highly appreciated development of sports infrastructure in the region. “In the region much is done for development of sports. Yamal is one of the leaders in the country in involvement of population in sports. The targets for providing residents with sports objects have been exceeded. But the region does not stop there. There are many plans for development of infrastructure and holding of major competitions”, Pavel Kolobkov commented on the results of the meeting. In Yamal the level of providing of residents with sports objects makes 57.5%. On an average, this figure makes 50% in Russia. In the coming years about 50 sports objects will be built in the region, including the complex “Yamal Arena” and the network of modular sports bases, as the press service of the governor of Yamal informs. The participants of the meeting also discussed development of ethnic kinds of sport. In 2018 sportspeople of Yamal won 12 medals at the All-Russian competitions and set the record of Russia in throwing of a tynzyan on a khorey. Pavel Kolobkov expressed his readiness to support development and popularization of sports traditional for the North. (The note: a tynzyan is a rope-lasso for catching a reindeer, and a khorey is a long pole for driving a reindeer sleigh).